Information may be updated as needed. Please check back before the conference. Move-in Date: Thursday, 6/27 and Friday, 6/28 (please see times below). Location: The Conference will be held at the Linn County Expo Center. From I-5, take the Knox Butte Rd. E Exit. Take Knox Butte Rd. E. to Timber St. SE (next right after Expo Pkwy. NE.). Turn right onto Price Rd. SE. Take the 2nd right into the Expo Center parking lot (the first right is the public parking). Drive up to the last building where an OCEANetwork volunteer will direct you to the appropriate loading door. All loading doors are at ground level. There are no ramps or docks. When you arrive, there will be OCEANetwork volunteers to direct you to a loading dock. We will have a few volunteers on hand to help you unload if needed and get things to your booth. Please label what you bring to help us keep your belongings together and get them to your booth. Once your vehicle is unloaded, you can park it in the free public parking area and continue to set-up your booth. Move-in Times: 1:00 pm- 6:00 pm. If you arrive earlier than 1:00 pm, you will need to wait in the public parking area. PLEASE DO NOT TRY TO MOVE IN EARLIER. Once your vehicle is unloaded and parked, stop by the exhibitor check-in booth in front of the main entrance to the hall. We will give you your welcome packet, including your name badges, schedule, and Giveaway Extravaganza details (if purchased). Each booth purchased includes two exhibit hall passes. If you plan to have additional exhibitors taking shifts at your booth, you may purchase additional exhibit hall-only passes at the door. Per your contract, exhibitor passes (name badges) are not transferrable. If your own children (age 16 & under) will be with you, please ask for free wristband passes for them when you check in. If you are travelling light and wish to move-in Friday morning, doors will open for exhibitors at 8:00 am. Please be sure to have your booth set-up and ready for the public by 9:30 am. Saturday - 9:30 am - 6:00 pm. Move-out, Saturday, from 6:00 p.m.: The exhibit hall closes at 6:00 p.m. on Saturday. Do not bring your vehicle to the loading dock until all of your materials are packed, labeled, and completely out of your booth and ready in the staging area just inside the docks. Shipping Materials: If you will be shipping materials directly to the venue, make certain they do not arrive earlier than three days prior to the event. Label the package(s) for the "OCEANetwork Conference- 6/28". 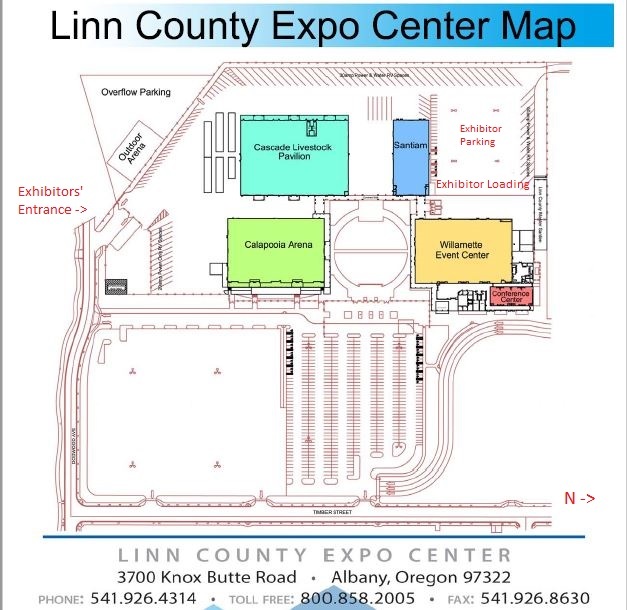 If your materials take more than a few minutes to handle, the Linn County Expo will charge a handling fee that will be charged to the credit card used for registration. Please let us know if you have questions or concerns before shipping your materials. Thank you for your participation in this great event, we look forward to seeing you soon! DIRECTIONS: From I-5 in Albany, take Exit 234 (234A from I-5 S). Continue on Knox Butte Rd E. Turn right onto Expo Pkwy NE. The venue is approx. 3/10 of a mile east of I-5. LODGING: The Comfort Suites (541-928-2053) and Holiday Inn Express (541-928-8820) are right next door (you don't even have to cross the street). Be sure to ask for the OCEANetwork rate at the time of booking. If you have an RV, the Expo Center has RV parking with hook-ups available. You can reserve your spot here. There is also an RV park just across the street, and a KOA campground nearby. Thanks so much for including us in the OCEANetwork conference. It was just wonderful --- on so many levels. So great to connect with lots of Christian families in a wonderful atmosphere! It was very good exposure for my business also.